I had a feel good Thursday at the San Francisco Symphony last night and that got me wondering if there were any programs that would make them a good subject for Feel Good Friday. The answer? Yes! The San Francisco Symphony has been a part of city life since their first concerts in 1911 and they've been a part of San Francisco classrooms since 1988. As explained on their website, the Adventures in Music (AIM) program "includes in-school presentations by music ensembles, specially designed classroom curriculum, classroom materials and a visit to Davies Symphony Hall for a private concert by the San Francisco Symphony." There are two programs targeted to students in different grades and together they reach every student in grades 1-5 in the SF Unified School District. That's more than 25,000 children in 95 schools! You can watch a 2:20 min video of the program, and see adorable kids playing triangles, here. In addition, students from kindergarten to grade 9 can attend special concerts which help introduce them to musical concepts and ideas. Materials are sent to the classroom ahead of the concert and teachers can also request a visit by an education docent to help prepare the students. Students from grades 9-12 are invited to attend open rehearsals of the symphony and teachers can find many helpful resources at this link. For kids who want to continue to learn more about music there is a separate website, SFS Kids, where you can read about and try to play a variety of instruments, conduct an orchestra of animals and compose your own music! 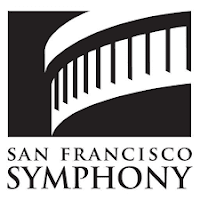 If you want more SF Symphony in your life, you can buy tickets to a performance, watch their extensive collection of videos and stay in the social media loop by liking their Facebook page and following them on Twitter @SFSymphony.